A behind the scenes video of the manufacturing of the Light Phone. The smallest investment amount that Light is accepting. Light needs to reach their minimum funding goal before the deadline. If they don’t, all investments will be refunded. If a trigger event for Light occurs, the discount provision gives investors equity shares (or equal value in cash) at a reduced price. Light needs to raise $25K before the deadline. The maximum amount Light is willing to raise is $107K. Joe graduated valedictorian of the School of Visual Arts. He ran a studio and worked as an animator, film maker, illustrator and fine artist. He was recognized as a top 20 under 30 visual artist by Print Magazine in 2014 and an ADC Young gun in 2016. Kaiwei has 10 years experience in product development. He has brought 12 mobile devices to life by leading multi-national teams from design stage through mass production. He has masters degrees in design and business from I.I.T. Chicago. Eileen served as VP of operations at Working Assets/CREDO Mobile, a direct marketing driven, $140 million, privately-held mobile and long distance phone company. She managed operations and customer care within the mobile phone business. Boon worked for Foxconn as a hardware product manager in China for over 10 years. He has extensive experience with Chinese suppliers and factories and has a track record of successfully launching products on time. Ben was the co-founder, Chairman and CEO of Clearwire, the first 4G carrier in the US and Europe. He served as President of Eagle River Investments and also served on the Board of Directors of the Cellular Telecommunications Industry Association. A member of the mission-driven business community as a social entrepreneur and investor. He's spent 16 years as CEO in manufacturing, 8 years as an angel investor, and 4 advising mission-aligned capital strategy, deal sourcing and due diligence. John co-founded the design, strategy, and architecture firm Super-Interesting! He is the Director of the Strategic Design program and Assistant Professor of Strategic Design + Management, at Parsons School of Design. He also teaches at S.V.A. Joe is a designer, educator and partner at Small Stuff. He has over 10 years experience working with Pentagram, Landor and Apple for a variety of clients and organizations. Is a Dumber Phone a Better Phone? "My other phone is just a phone." What is The Light Phone? The Light Phone is a discreet credit card sized mobile phone designed to be used as little as possible. It is the only phone designed to be used as your second phone as a seamless extension of your smartphone. It is an unlocked 2G GSM phone that works independent of your current plan, but using our unique software platform it can keep your same phone number. The Light Phone is easily set up and controlled via an app on your computer. Other features are limited to nine speed dials and a time display. An active SIM is required because the phone is not tethered, it will work regardless of where your smartphone is. The cost of using our service is approximately $5/month in the United States. The Light Phone is your second phone, like how we have different shoes for different occasions, this is your phone for going light. Out of the box, plug the phone into your computer and download our app. The phone will update, an account will be created, and you will set up your 9 speed dials. To go light, you will need to turn on call forwarding on your smartphone using a contact that the app creates for you. (Note: your carrier must support call forwarding for this to be possible) The Light Phone will use your existing phone number for outbound calls. 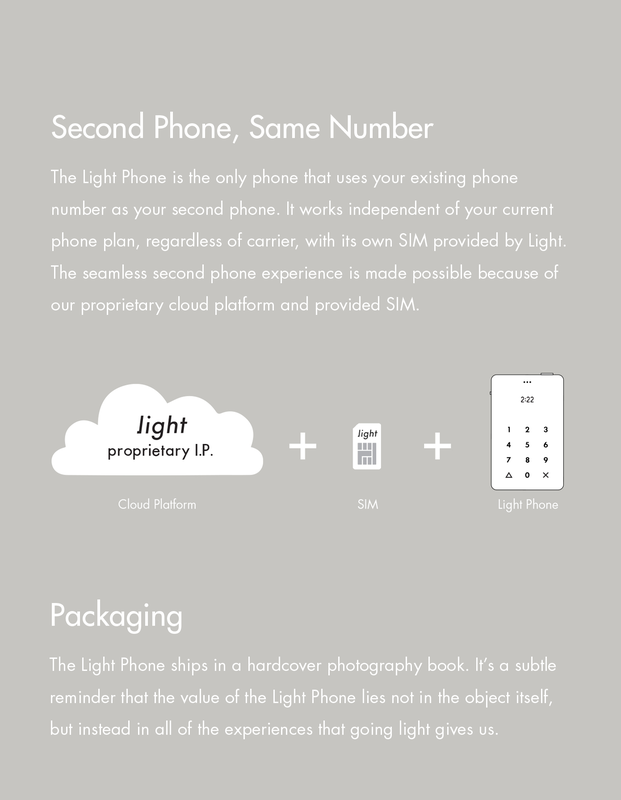 The Light Phone is a new product, and the experience will be evolving and improving over time. How is it different from other basic phones? The Light Phone is the only phone that is designed to be used as a second phone. We have a unique software platform that makes the call management & call forwarding seamless in a way that no other phone can offer. The form factor makes it fit invisibly into your life, and the interface respects the user in its simplicity. It makes disconnecting feel special. Unlike a basic flip phone, you cannot text, email or anything else really. It is the most simple phone and a complement to your existing smartphone. The Light Phone, although incredibly simple, is actually running a stripped down version of Android and is quite a smart "dumb" phone which will allow us to continue to perfect the light experience with a roadmap of features. The Light Phone is set up through a desktop app on your computer. Will it work with my carrier? The Light Phone works independent of your carrier as a stand alone phone with its own nano 2G GSM SIM. The Light Phone will require service and we are offering the whole experience (SIM + app) for $5 a month. Does it text? Wifi? Bluetooth? Data? Why no texting? Why ten speed dials? We are thoughtfully limiting our technology, 'going light', so that we can reconnect in meaningful ways with the world around us. These were design decisions that were carefully made for what it means to be light. The Light Phone is for sale for $150 plus shipping and handling. In the United States this includes our SIM with 5 months of free service, which will cost $5/month to keep the SIM active thereafter. International users may incur additional customs fees which are out of our control, please check with your customs office before you order. Can it work as a stand alone phone? The Light Phone comes with a SIM card, and our Light Micro USB cable. We are going to make it as special as possible, expect pleasant surprises. *Unfortunately we cannot provide a SIM to our international users yet. We have spent the last year talking with dozens of carriers and MVNOs and have found an amazing partnership to offer the Light Phone SIM and software platform experience for $5 a month. Light Phone orders come with 5 months of free service as a thank you for your patience. International users have no service fee, but will need to provide their own SIM and will not have access to our cloud platform initially. Can two phones forward to one Light Phone? In theory yes this might all be possible, but this is a feature that will not be available at launch. The Light Phone is a new product with a small, but passionate team behind it. We will be working closely with users to get feedback and continually improve the experience. Thank you for understanding and coming along for the ride. Will it work if my phone dies? The Light Phone will work independent of your smartphone. You will always be able to place any call, including your speed dials. However, you must turn on call forwarding before your smartphone dies to receive calls forwarded from your primary number. The Light Phone is not waterproof, however, because of its compact size, we plan to offer awesome accessories like a waterproof beach wallet. In thinking about how to make The Light Phone as invisible as possible, we decided that by being the same size as an I.D. or credit card, which you always carry on your person, there would always be a place to put the phone. It's a very classic size, and feels great to hold. What about # and * buttons? Two rather uncommon buttons, especially for the purpose of this phone, can be used with long holds X. This will be explained in the User Guide. What is next for Light? The Light Phone is our first product, but Light is a brand dedicated to designing beautiful objects that respect and empower. We are currently working on an improved iteration of the existing Light Phone which we're really excited about. We look forwarding to putting the 'light' touch on to other devices as well. The development and commercialization of the Light Phone is highly competitive. We face competition with respect to any products that we may seek to develop or commercialize in the future. Our competitors include major companies worldwide. Many of our competitors have significantly greater financial, technical and human resources than we have and superior expertise in research and development, and marketing approved mobile phones. Thus, our competitors may be better equipped than us to develop and commercialize mobile phones. These competitors also compete with us in recruiting and retaining qualified personnel and acquiring technologies. Smaller or early stage companies may also prove to be significant competitors, particularly through collaborative arrangements with large and established companies. Consequently, our competitors may commercialize products more rapidly or effectively than we are able to, which would adversely affect our competitive position, the likelihood that our products will achieve initial market acceptance and our ability to generate meaningful additional revenues from our products. The Light Phone relies on the scalability of cloud services. A significant benefit of the Light Phone experience is the ability to use the same phone number across a customer's smartphone and Light Phone, our principal product. We have launched this service in the United States, but have not yet proven our ability to scale it to a larger customer base, or to support it outside the United States. If we are unable to sufficiently scale the Company and corresponding cloud services, we will be unable to market one of the key development features of the Light Phone, resulting in lower Company revenues and decreased market share. The Company intends to use the proceeds from the Offering for ongoing working capital. This means that the Company has ultimate discretion to use the proceeds as it sees fit and has chosen not to set forth any specific uses for Purchasers to evaluate. The net proceeds from this Offering will be used for the purposes our management deems to be in our best interests in order to address changed circumstances or opportunities. As a result of the foregoing, our success will be substantially dependent upon our discretion and judgment with respect to application and allocation of the net proceeds of this Offering. The Company may choose to use the proceeds in a manner that the Purchasers do not agree with and they will have no recourse. A use of proceeds that does not further the Company's business and goals could harm the Company and its operations and ultimately cause a Purchaser to lose all or a portion of his or her investment. We rely on other companies to provide components of the Light Phone. We depend on these suppliers and subcontractors to meet our contractual obligations to our customers and to conduct our operations. Our ability to meet our obligations to our customers may be adversely affected if suppliers or subcontractors do not provide the agreed-upon supplies or perform the agreed-upon services in compliance with customer requirements and in a timely and cost-effective manner. Likewise, the quality of our products may be adversely impacted if companies to whom we delegate manufacture of major components or subsystems for our products, or from whom we acquire such items, do not provide components which meet required specifications and perform to our and our customers' expectations. Our suppliers may be less likely than us to be able to quickly recover from natural disasters and other events beyond their control and may be subject to additional risks, such as financial problems, that limit their ability to conduct their operations. The risk of these adverse effects may be greater in circumstances where we rely on only one or two subcontractors or suppliers for a particular component. In certain instances, we rely on single or limited service providers and outsourcing vendors in China and the United States because the relationship is advantageous due to quality, price, or lack of alternative sources. If production or service was to be interrupted and we could not find alternate third-party providers, we could experience disruptions in manufacturing and operations including product shortages, higher freight costs and re-engineering costs. If outsourced services are interrupted or not performed or the performance is poor, this could impact our ability to process, record and report transactions with our customers and other constituents. Such interruptions in the provision of supplies and/or services could result in our inability to meet customer demand, damage our reputation and customer relationships and adversely affect our business. We depend on third party providers, suppliers and licensors to supply some of the software and operational support necessary to provide some of our services. Some of our software and operational support vendors represent our sole source of supply or have a position of some exclusivity, through contract or intellectual property rights. If demand exceeds these vendors' capacity or if these vendors experience operational or financial difficulties or if these vendors are otherwise unable to provide the satisfactory equipment or services we need in a timely manner and at a reasonable price, then our ability to provide some services might be materially adversely affected. Additionally, the need to procure or develop alternative sources of the affected material or services might delay our ability to serve our customers. Furthermore, these events could materially and adversely affect our ability to retain and attract customers, and could cause a material negative impact on our operations, business, financial results and financial condition. There are substantial risks and uncertainties associated with these efforts, particularly in instances where the markets are not fully developed. In developing and marketing new lines of business and/or new products and services, we may invest significant time and resources. Initial timetables for the introduction and development of new lines of business and/or new products or services may not be achieved and price and profitability targets may not prove feasible. We may not be successful in introducing new products and services in response to industry trends or technological development, or those new products may not achieve market acceptance. As a result, we could lose business, be forced to price products and services on less advantageous terms to retain or attract clients, or be subject to cost increases. As a result, our business, financial condition or results of operations may be adversely affected. In general, demand for our products and services is correlated with general economic conditions. A substantial portion of our revenue is derived from discretionary spending by individuals, which typically falls during times of economic instability. Declines in economic conditions in the United States or in other countries in which we operate may adversely impact our consolidated financial results. Because such declines in demand are difficult to predict, we or the industry may have increased excess capacity as a result. An increase in excess capacity may result in declines in prices for our products and services. Through our operations, we collect and store certain personal information that our customers provide to purchase the Light Phone, register on our web site, or otherwise communicate and interact with us. We may share information about such persons with vendors that assist with certain aspects of our business. Security could be compromised and confidential customer or business information could be misappropriated. Loss of customer or business information could disrupt our operations, damage our reputation, and expose us to claims from customers, financial institutions, payment card associations and other persons, any of which could have an adverse effect on our business, financial condition and results of operations. In addition, compliance with more restrictive privacy and information security laws and standards may result in significant expenses due to increased investment in technology and development of new operational processes. We collect and store sensitive data, including intellectual property, our proprietary business information and that of our customers, suppliers and business partners, and personally identifiable information of our customers and employees, in our data centers and on our networks. The secure processing, maintenance and transmission of this information is critical to our operations and business strategy. Despite our security measures, our information technology and infrastructure may be vulnerable to attacks by hackers or breached due to employee error, malfeasance or other disruptions. Any such breach could compromise our networks and the information stored there could be accessed, publicly disclosed, lost or stolen. Any such access, disclosure or other loss of information could result in legal claims or proceedings, liability under laws that protect the privacy of personal information, and regulatory penalties. Additionally, it could disrupt our operations and the services we provide to customers, damage our reputation, and cause a loss of confidence in our products and services, which could adversely affect our business/operating margins, revenues and competitive position. The secure processing, maintenance and transmission of this information is critical to our operations and business strategy, and we devote significant resources to protecting our information. It should be noted that the information collected and saved does not include financial information such as credit card numbers or banking information. In certain circumstances, export control and economic sanctions regulations may prohibit the export of certain products, services and technologies. In other circumstances, we may be required to obtain an export license before exporting the controlled item. Compliance with the various import laws that apply to our businesses can restrict our access to and increase the cost of obtaining, certain products and at times can interrupt our supply of imported inventory. The Company's success depends on the experience and skill of key employees. The Company is dependent on Kaiwei Tang and Joseph Hollier, who are CEO and President of the Company, respectively, in order to conduct its operations and execute its business plan. The loss of Kaiwei Tang and Joseph Hollier could harm the Company's business, financial condition, cash flow and results of operations. Furthermore, the Company has not purchased any insurance policies with respect to those individuals in the event of their death or disability. Therefore, if either Kaiwei Tang or Joseph Hollier dies or becomes disabled, the Company will not receive any compensation to assist with such person's absence. Therefore, Purchasers have no audited financial information regarding the CompanyÕs capitalization or assets or liabilities on which to make their investment decision. If Purchasers feel the information provided is insufficient, they should not invest in the Company. Maintaining, extending and expanding our reputation and brand image are essential to our business success. We seek to maintain, extend, and expand our brand image through marketing investments, including advertising and consumer promotions, and product innovation. Increased attention on marketing could adversely affect our brand image. It could also lead to stricter regulations and greater scrutiny of marketing practices. Existing or increased legal or regulatory restrictions on our advertising, consumer promotions and marketing, or our response to such restrictions, could limit our efforts to maintain, extend and expand our brands. Moreover, adverse publicity about regulatory or legal action against us could damage our reputation and brand image, undermine our customersÕ confidence and reduce long-term demand for our products, even if the regulatory or legal action is unfounded or not material to our operations. In addition, our success in maintaining, extending, and expanding our brand image depends on our ability to adapt to a rapidly changing media environment. We increasingly rely on social media and online dissemination of advertising campaigns. The growing use of social and digital media increases the speed and extent that information or misinformation and opinions can be shared. Negative posts or comments about us, our brands or our products on social or digital media, whether or not valid, could seriously damage our brands and reputation. If we do not establish, maintain, extend and expand our brand image, then our product sales, financial condition and results of operations could be adversely affected. We are vulnerable to fluctuations in the price and supply of components, packaging materials, manufacturing and freight. The prices of the components, packaging materials, manufacturing and freight are subject to fluctuations in price attributable to, among other things, changes in supply and demand of components, fuel prices and labor costs. The sales prices to our customers are a delivered price. Therefore, changes in our input costs could impact our gross margins. Our ability to pass along higher costs through price increases to our customers is dependent upon competitive conditions and pricing methodologies employed in the various markets in which we compete. If competitors do not increase their prices, customers and consumers may choose to purchase competing products or may shift purchases to lower-priced private label or other value offerings which may adversely affect our results of operations. Substantial disruption to production at our manufacturing and distribution facilities could occur. A disruption in production at our third-party manufacturing facility could have an adverse effect on our business. In addition, a disruption could occur at the facilities of our suppliers or distributors. The disruption could occur for many reasons, including fire, natural disasters, weather, water scarcity, manufacturing problems, disease, strikes, transportation or supply interruption, government regulation, cybersecurity attacks or terrorism. Alternative facilities with sufficient capacity or capabilities may not be available, may cost substantially more or may take a significant time to start production, each of which could negatively affect our business and results of operations. The SAFEs (Simple Agreements for Future Equity) will not be freely tradable until one year from the initial purchase date. Although the SAFEs may be tradable under federal securities law, state securities regulations may apply and each Purchaser should consult with his or her attorney. Purchasers should be aware of the long-term nature of this investment. There is not and likely will not be a public market for the SAFEs (Simple Agreements for Future Equity). Because the SAFEs have not been registered under the Securities Act or under the securities laws of any state or non-United States jurisdiction, the SAFEs have transfer restrictions and cannot be resold in the United States except pursuant to Rule 501 of Regulation CF. It is not currently contemplated that registration under the Securities Act or other securities laws will be effected. Limitations on the transfer of the SAFEs may also adversely affect the price that Purchasers might be able to obtain for the SAFEs in a private sale. Each Purchaser in this Offering will be required to represent that it is purchasing the Securities for its own account, for investment purposes and not to resale or distribute thereof. There is no assurance that a Purchaser will realize a return on its investment or that he or she will not lose his or her entire investment. For this reason, each Purchaser should read the Form C and all Exhibits carefully and should consult with his or her own attorney and business advisor prior to making any investment decision. Prior to the Offering, the CompanyÕs current owners of 20% or more beneficially own 67.35% of the Company. Subject to any fiduciary duties owed to our other owners or Purchasers under Delaware law, these owners may be able to exercise significant influence over matters requiring owner approval, including the election of directors and approval of significant Company transactions, and will have significant control over the CompanyÕs management and policies. Some of these persons may have interests that are different from those of the Purchasers. For example, these owners may support proposals and actions that the Purchasers may disagree with. The concentration of ownership could delay or prevent a change in control of the Company or otherwise discourage a potential acquirer from attempting to obtain control of the Company, which in turn could reduce the price potential Purchasers are willing to pay for the Company. In addition, these owners could use their voting influence to maintain the CompanyÕs existing management, delay or prevent changes in control of the Company, or support or reject other management and board proposals that are subject to owner approval. The Company may extend the Offering deadline beyond what is currently stated herein. This means that the PurchasersÕ investments may continue to be held in escrow while the Company attempts to raise the Minimum Amount even after the Offering deadline stated herein is reached. PurchasersÕ investments will not be accruing interest during this time and will simply be held until such time as the new Offering deadline is reached without the Company receiving the Minimum Amount, at which time it will be returned to them without interest or deduction, or the Company receives the Minimum Amount, at which time it will be released to the Company to be used as set forth herein. Upon or shortly after release of such funds to the Company, the Securities will be issued and distributed to Purchasers. In a dissolution or bankruptcy of the Company, Purchasers of Securities that have not been converted will be entitled to distributions as if they were common stock holders. This means that such Purchasers will be at the lowest level of priority and will only receive distributions once all creditors as well as holders of more senior securities, including any preferred stock holders, have been paid in full. If the Securities have been converted into CF Shadow Securities, the Purchasers will have the same rights and preferences (other than the ability to vote) as the holders of the Securities issued in the equity financing upon which the Securities were converted. Unlike convertible notes and some other securities, the Securities do not have any "default" provisions upon which the Purchasers will be able to demand repayment of their investment. The Company has ultimate discretion as to whether or not to convert the Securities upon a future equity financing and Purchasers have no right to demand such conversion. Only in limited circumstances, such as a liquidity event, may the Purchasers demand payment. Even then, such payments will be limited to the amount of cash available to the Company. The Company may never receive a future equity financing or elect to convert the Securities upon such future financing. In addition, the Company may never undergo a liquidity event such as a sale of the Company or an IPO. If neither the conversion of the Securities nor a liquidity event occurs, the Purchasers could be left holding the Securities in perpetuity. The Securities have numerous transfer restrictions and will likely be highly illiquid, with no secondary market on which to sell them. The Securities are not equity interests, have no ownership rights, have no rights to the Company's assets or profits and have no voting rights or ability to direct the Company or its actions. In addition to the risks listed above, businesses are often subject to risks not foreseen or fully appreciated by the management. It is not possible to foresee all risks that may affect us. Moreover, the Company cannot predict whether the Company will successfully effectuate the Company's current business plan. Each prospective Purchaser is encouraged to carefully analyze the risks and merits of an investment in the Securities and should take into consideration when making such analysis, among other, the Risk Factors discussed above. I think it is a great idea. Too many people are staring at their phones indulging in social media, etc. This is a great attempt to get back to basics with mobile phones for the original purpose. I TRULY believe in this concept of being present. I also like it's on Republic's platform and that in the future you guys might do a waterproof version! I am not a high tech person as such with the older generation who have no idea how to use a smart phone. However the light phone with it's simplicity will allow those such as me to just simply make or take a call. I like the concept of the light phone. Because this is something that fills a need. Looks like an interesting technology. A future-forward idea! Demonstrable proof of concept. Solid team & partners. First mover advantage (time will tell). This is my first investment as I am wanting to become an angel investor. This product looks very interesting and seems like it could have some market appeal. I believe that this is a much needed product. The team looks to be well versed in the industry. Team members have varied backgrounds which usually produces a positive result. In the future we need to spend our short time on earth on things that mathers and on not cat-videos and fake portraits of other peoples lives. Great idea, really excited to try the product. This phone is not just another product. It's a tool to help us live better, happier lives. In a world too plugged in, we need to learn how to unplug to enjoy life itself and Light is the phone for that. I'm interested in companies that create and build technologies. I love the idea of this device and I think that I actually NEED it. I think lots of people might NEED it. That seems powerful. I invested in Light because I believe it will help our future. Us humans are to attached to our screens and we often miss the important things in our life (you know... the real physical things you can touch and see with your eyes). I've ALWAYS wanted to build a high-quality phone that had limited functionality—always-on is getting to us. I thought back to my time at Flextronics and knew there was an inexpensive, high-quality product to be made here. Congrats on getting started. I love the concept and this is a REAL product that I would use and love. Because I firmly believe in their mission statement and their vision of giving life back to the living. If they can make it happen, I want one. I've been following the Light team for some time now with great curiosity. Aside from the success of their Kickstarter campaign, I believe in the hardware they're building and the ideology behind it. We have seen many consumer devices after smart phone success, none of them really connected to consumer. Light will definitely be successful consumer device after smartphone. Found Light on Producthunt, looks super cool! Sustainable business with patent; practical; novel. I believe in the product! This is the best solution I've seen to date to help solve smartphone addiction. I believe in what Light is doing. I love the mission. I love the design. The brand has legs. I love the idea of having different devices per context. And Light is to disconnect. I love the concept plus a free phone perk made it an east decision. I began my relationship with Light as an early post-Kickstarter supporter. Light has helped me empower myself to disconnect from the world while still maintaining the relationships I thrive upon in my work and personal lives. I believe in disconnecting, and I am sure that people agree, and more will follow. I love simplicity and really look forward to becoming an advocate! I use this service for myself and would likely use this product if offered. I like the idea of a second phone with the same # that you can take anywhere with out the worry of loosing you more expensive phone on a hike in the mountains. Light represents an antidote to the over connected lifestyle we seem to be living these days; a reminder to be in the moment. Simple, inexpensive and liberating! I like the minimalistic design and the idea of disengaging for few hours from our current smartphones or other mobile digital devices, while we are living on the "digital era". I invested because I believe the movement towards simpler tech will have a niche market and one that an ecosystem can be built around. I think time interacting with my family is tantamount to their what my kids' kids will become. I think that people spend too much time on their phones and that Light will be a delightfully light way to disembody oneself from constant usage. I researched and then invested in Light on the recommendation of my early investing financial guide.